Keystroke Studios (and its principal, Hank Bonney) have been building premier-quality Web sites since 1998. 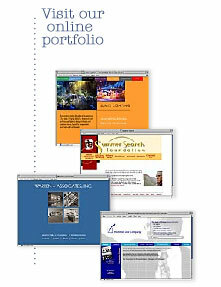 We specialize in design for startups and small-to-medium-sized businesses in Boston and the New England region. Our clients' sites are clean in design, easy to navigate, and lightning-fast to load. Whether your goal is to sell your products online or to promote your company in an uncompromisingly professional manner, we can build a Web site that places your business in the first rank. We guide our clients through the process of understanding, developing, designing, and using the Internet to achieve real business gains: increased sales, new clients, and more effective operations. We understand the importance of business practicalities and an unwavering focus on detail. The result? Projects undertaken by Keystroke Studios get done right the first time, on time, and on budget. Having a small staff allows us to offer low prices, but there are more salient advantages to our size. Direct involvement is possible throughout all the phases of the project, which ensures premier quality and tight control. Communications are immediate, rather than moving through levels. We are able to act with speed and agility, and to adapt immediately to changes and requests. And we can attain a knowledge and intimacy with your business that a larger, more impersonal Web development firm couldn't hope to achieve. We are a loyal business partner to our clients, providing them with ongoing technical and graphical expertise in Web development and design. Our clients have full confidence that we will always be there when they need us. When they entrust us with developing their Internet presence, we adopt genuine interest in the growth of their businesses. Thank you for visiting our site and for considering Keystroke Studios as your business partner. Contact us  we'll be pleased to tell you more.